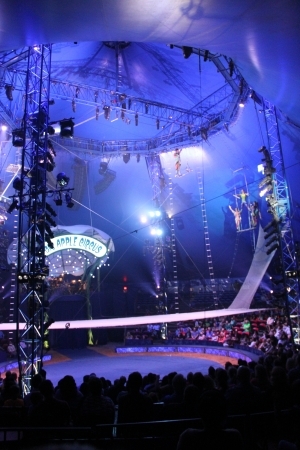 Fly away to the magical circus ring inside the Big Apple Circus! Astonishing acts and startling transformations will transport you to a realm of enchantment under the Big Top! But, you don’t have to go far from home to experience all the wonder and amazement only the Big Apple Circus Metamorphosis will bring to the whole family at The Ridgefield Playhouse on Friday, November 21, at 7 p.m. through the power of a high definition broadcast direct from The Big Top Tent at Lincoln Center. The perfect show for all ages -- for kids 3 years old and up -- the Big Apple Circus is an ideal event for parents, grandparents and grandkids to have old-fashioned fun together, and everyone has a ringside seat! The show runs approximately 2 hours with a 15-minute intermission. This event is partially underwritten by The Toy Chest with media sponsor 98Q. Big Apple Circus Metamorphosis soars on wings of artifice and illusion, to a dreamscape domain where nothing is impossible. Associated Press gushes: “Big Apple Circus is “Old-Fashioned Fun...The Circus you’d like your child to remember.” For the first time in its 37-year history, Big Apple Circus will beam its brand new show Metamorphosis into hundreds of movie theaters around the world. Metamorphosis features performers from the U.S., Russia, France and Mongolia, in an array of classical circus artistry including clowning, juggling, acrobatics and equestrianism (with completely animal-friendly acts). Appearing before your very eyes: The thrilling flyers of the trapeze, swooping and swirling through circus skies. The razzle-dazzle of the rolla-bolla, an act that teeters right on the edge of equilibrium. An aerial space-age acrobatic adventure — an ascent to amazement! The risky rhythms of the Risley team, twisting and turning, topsy-turvy… The cadenzas of camels and horses, and the exuberance of playful pooches… The incredible flexible limbs of the contortionist in an act that will literally bend the imagination. And Francesco the Clown, captivating the crowd with his musical merriment and gentle humor. Under the direction of maestro Rob Slowik, the renowned Big Apple Band provides as always the live and glorious tunes of the sawdust spectacular. Big Apple’s irrepressible Ringmaster, the illustrious and incomparable John Kennedy Kane, will summon the spirits of the circus universe to immerse the audience in the wonder, the joy and the astounding magic of Metamorphosis! For tickets ($15 adults, $7.50 children), call (203) 438-5795, or order online at ridgefieldplayhouse.org. The Ridgefield Playhouse is a not-for-profit performing arts center located at 80 East Ridge, parallel to Main Street, Ridgefield, CT.